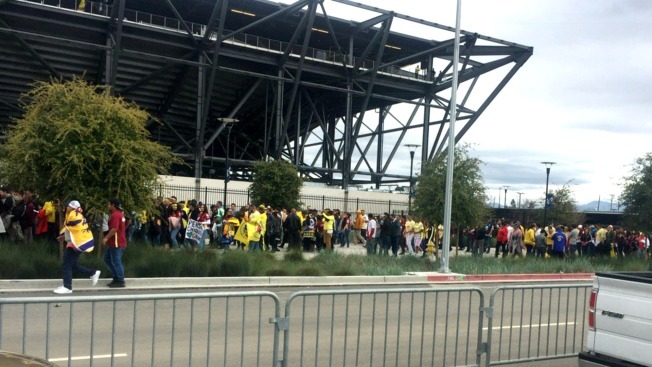 San Jose police were tasked with defusing tense altercations Sunday afternoon near Avaya Stadium just before a friendly soccer match between two clubs from Mexico. Opposing fans representing Liga MX's Club America and Monarcas Morelia threw rocks, bottles and other objects at each other, and a fence was torn down during the skirmish, police said. Officers responded quickly and were able to de-escalate the situation. Dozens of police cruisers and police in riot gear were spotted congregating around the stadium just before the start of the match. Some people suffered minor injuries, but no major injuries were reported and no arrests were made, police said. Police personnel remained at the scene to monitor the situation throughout the evening. Police added that the violence was not directed at officers. "It just got rowdy," said a fan named Dave, whose head was wrapped in a bandage after he'd been hit by a rock. "The two squads don't get along, you know, it's been a rivalry for years; it comes from Mexico City." The soccer match, which featured the two sides from Mexico's premier soccer division, kicked off at 4 p.m. Club America hails from Mexico City while Monarcas Morelia is based out of Morelia, which is situated roughly 135 miles from the capital city. About 18,000 attended the sold-out game. Stadium managers shut down beer sales at halftime and worked with police on crowd control. After the game, the police presence was high. There was one small scuffle, but officers intervened immediately.